Pittsburgh is 89th on the alphabetical list of 130 municipalities in Allegheny County. Unlike other cities that expanded their boundaries as they grew, Pittsburgh pretty much remained in place while surrounding communities developed on their own. Here are some of the many with personality, charm and amenities that anyone might like to call home. Take a drive and check these out for yourself. You might run into me exploring them, too. This 1.57-square-mile borough 14 miles northeast of Pittsburgh is filled with Pinterest-worthy houses along tree-lined streets named for the original 13 Colonies. Along the main drag, many shops, restaurants and other family-owned businesses welcome the 6,300-plus residents and visitors. Landmarks include Oakmont Bakery (named one of America’s best by Bake magazine), Carabella’s Clothing Boutique and the Oaks Theater, an art deco-style, single-screen movie house built in 1938. Oakmont Country Club is the borough’s most famous resident and has hosted the U.S. Open eight times, more than any other course. Pro: Great school district, old-fashioned community feel. Con: Takes a long time to get there on Allegheny River Boulevard. Its 33,137 residents love to gush about the many parks, the Uptown business district and top-notch school system. The municipality— incorporated in 1912 — has many distinct neighborhoods, including Virginia Manor, Mission Hills and Sunset Hills. Parts are listed on the National Register of Historic Places. Sunday mornings are busy as worshippers come from near and far to visit the more than 23 houses of worship, including eight historic churches along Washington Road that range from St. Bernard’s Catholic with its colorful tile roof to Southminster Presbyterian and its bell tower. The Uptown business district boasts bakeries, coffee shops, diners and restaurants, many with sidewalk seating and water dishes for dogs. Con: High property taxes, lots of deer. This is a walking community where residents can buy custom cakes at Ultimate Pastry Shop, work out at the YMCA and spend the afternoon at a number of spas and salons. Families also move here for the Quaker Valley School District. The high school ranks sixth in the state and 477th out of more than 21,000 high schools nationwide. Cultural amenities include the Sweetwater Center for the Arts. Houses are mostly Victorian and historic with lovely gardens, carved staircases and original hardwood floors. Greater Pittsburgh International Airport is just a 12-minute drive over the Sewickley Bridge. Pro: Walking community, lots of amenities. Just 7 miles north of Downtown on Interstate 279, you are smack dab in retail heaven at Ross Park Mall, which has Tiffany, Louis Vuitton and Armani. But this 14.5-square-mile township is about much more than shopping. Founded in November 1809, Ross has a mix of old (McKnight Village) and new (Highland Estates) neighborhoods, so its population of 31,205 is growing. That expansion has spilled over into neighboring McCandless, where the new town homes in McCandless Crossing share space with a Trader Joe’s, several chain restaurants and a movie theater. Jim Delegatti, who invented McDonald’s staples such as the Big Mac and the Egg McMuffin, tested his “special sauce” in the kitchen of his McDonald’s on McKnight Road. Pro: A quick jaunt home from Downtown and everything is close by. Con: They call it McNightmare Road. Henry Warner traveled to New York to purchase land from Annie Aspinwall with the idea of creating a town along the Allegheny River. He succeeded — in spades. 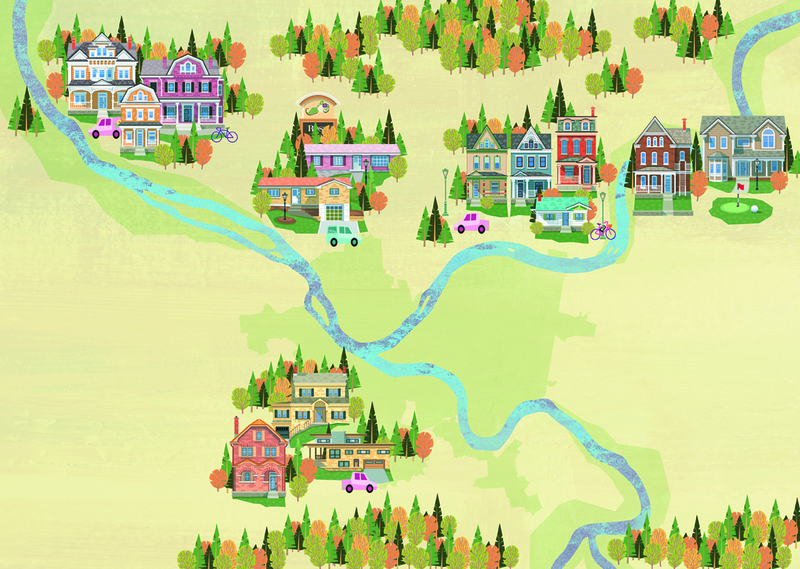 Today, this bedroom community packs 2,801 residents into its 0.5 square miles. The walkable neighborhood has a busy business district with many family-owned grocers, farm stands, dress stores, beauty spas and a hardware store. The community recently banded together to create the Aspinwall Riverfront Park (aspinwallriverfrontpark.org), which includes links to the waterway, bike trails and a children’s playground built around a huge bronze sculpture. Pro: Great location, great stores, small-town feel.